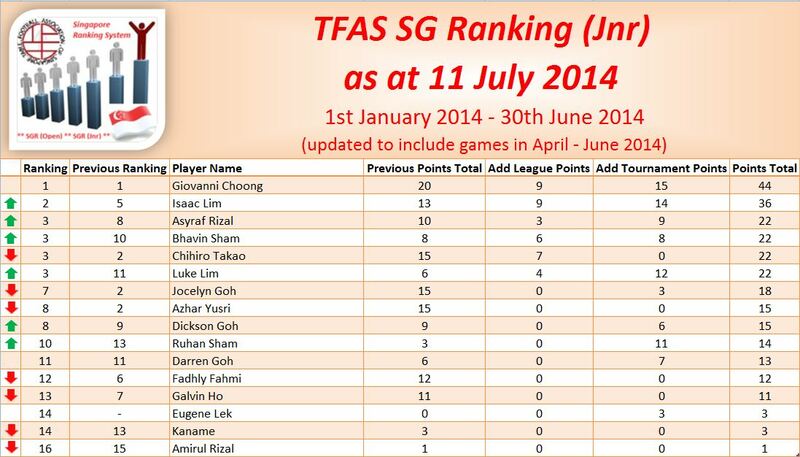 The latest TFAS SG Ranking as at 11 July 2014 is now officially released!! 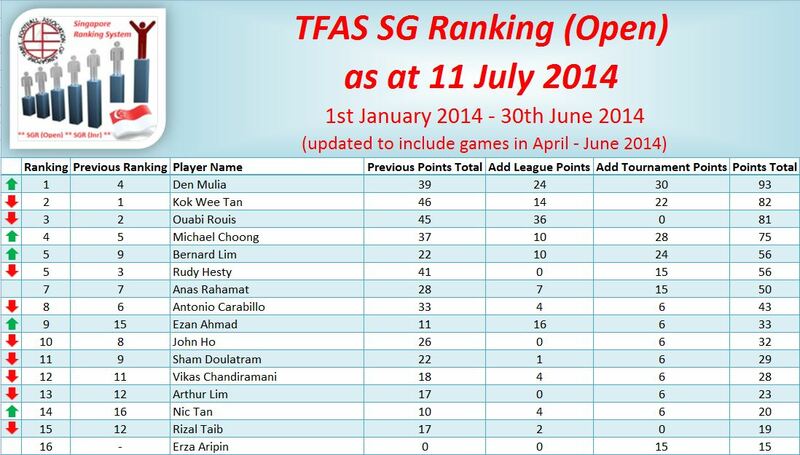 The current Number 1 top-ranked player in Singapore is Den Mulia Yusni!! Fresh from his successful defence of his National Champion title in the last weekend of June, Den Mulia takes over the top spot from the previous Number 1 player, Kok Wee Tan. Congratulations Den Mulia!! Kok Wee follows behind in 2nd spot while Ouabi Rouis is at Number 3, just 1 ranking point behind. Congratulations to Giovanni Choong too!! … for retaining his spot as the Number 1 top-ranked Junior player in Singapore!! Giovanni won the Junior National Champion title in the last weekend of June to consolidate his Number 1 spot. At Number 2 is Isaac Lim who climbed up 3 places after an impressive showing in the same tournament where he finished runners-up to Giovanni. Next up are 4 players tied at joint Number 3 and they are: Asyraf Rizal, Bhavin Sham, Chihiro Takao and Luke Lim. Among them, Luke made the most improvement by climbing up 8 places from his previous ranking. Well done Luke! !